Brazilian blowout is one of the hottest hair smoothing treatments out there, removing frizz, sealing in color, and adding a gorgeous reflective shine. It works by imbuing the hair with proteins that smooth, protect, and soften it, creating a spectacular effect that lasts for 10 to 12 weeks. 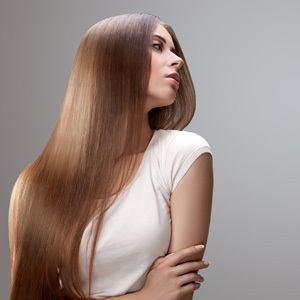 Unlike conventional straightening treatments which were popular in the past, Brazilian blowout treatments like the one provided by Udi Salon in Beverly Hills, CA are healthy and won’t damage your hair. If you want frizz-free hair that shines in all its glory, has volume, and is super easy to manage, the Brazilian blowout solution is perfect for you. All you have to do is head over to the Udi Salon in Beverly Hills and wait for our hairstylists to work their wonders. It all starts with some professional shampooing, after which the hair is dried and a Brazilian keratin treatment is applied carefully. Your hair is then blow-dried and flat-ironed, before the treatment is rinsed. Excellent results are noticeable from the first Brazilian blowout treatment you undergo, but if you do it regularly, the results will be even better. Find out more about the original Brazilian blowout here. Both treatments are similar in that they are non-damaging processes that make your hair more beautiful and easier to arrange and last for around 3 to 4 months – note though that your diet and lifestyle have an impact on the effect of the treatment. If you’re not sure about which treatment to get, just visit Udi Salon for a free consultation and we’ll assess the condition of your hair and recommend the best one for you. To be effective, a Brazilian blowout or keratin treatment has to be carried out by a professional stylist using high-quality products. It’s important to choose a salon that has experience in doing this treatment and can boast with a long list of satisfied, returning customers. If you live in the Beverly Hills area or are traveling through it, Udi Salon is your solution for a fast, high-quality, long-lasting Brazilian blowout treatment carried out by experienced and talented hairstylists. But more than quality, Udi Salon provides a warm and inviting atmosphere where you will feel at ease from the moment you step through our door. We at Udi Salon know that a woman’s hair is one of her most treasured possessions. That’s why we make sure our services are not only professional and speedy, but also careful and personal. Consultations are free, so you have nothing to lose visiting us. Schedule an appointment for a Brazilian blowout now!